The Mint Museum is preparing to launch an expansion of a project to digitize its art collection, thanks to a $100,000 grant from The John S. and James L. Knight Foundation. 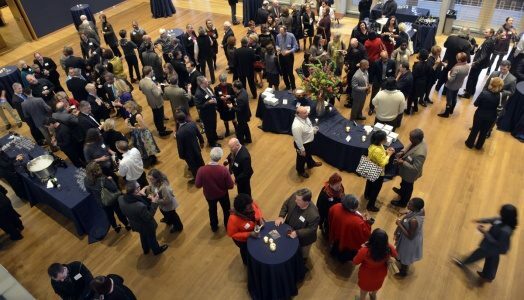 The Mint was among 13 Charlotte arts organizations receiving $1 million in grants announced at a celebration Friday evening at Mint Museum Uptown at Levine Center for the Arts, site of the Knight-supported work of art SEA to SEE. The interactive installation was created by North Carolina artist Mel Chin, a former Artist-in-Residence at McColl Center for Art + Innovation. The work, which suggests the experience of walking between two oceans with two large glass hemispheres and video and sound components, is part of the Mint-organized exhibition Connecting the World: The Panama Canal at 100. The exhibition, commemorating the centennial of the Canal’s completion in 1914, will remain on view through February 1. The new phase of the Knight grant will launch at the Mint following the closing of Panama Canal at 100. Building on previous grants received from the Knight and from the National Endowment for the Arts, the museum’s expanded digitization project will create virtual tours of the museum and its collections and special exhibitions, plus interviews with curators and artists. The project will enable local and global residents to virtually visit the museum through tools including Google Photosphere Imaging, which enables viewers to see detailed 3-D panoramas, and RTI Imaging, a photographic method allowing the interactive re-lighting of an object from any direction. The digitization work will focus in particular on 100 key works of art in the museum’s collection, including the signature works Threshold by Danny Lane and Mega Footprint Near the Hutch (May I Have this Dance?) by Sheila Hicks. “The Mint is grateful to the Knight Foundation for its significant support of our efforts to continue to bring art to as many members of our global community as possible, both virtually and inside the museum’s walls,” said Dr. Kathleen V. Jameson, president & CEO of the Mint.